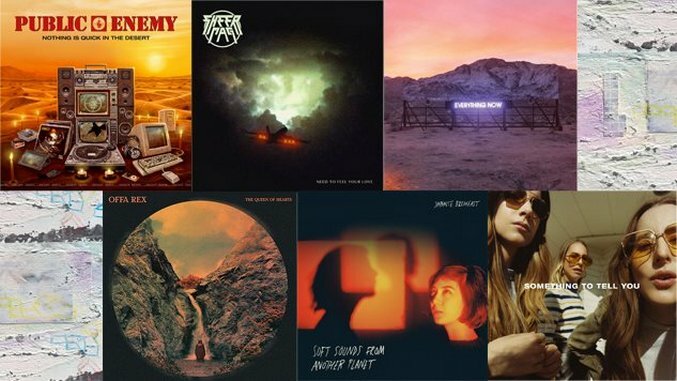 Arcade Fire, Haim, Broken Social Scene and Sheer Mag lead a huge month. We tend to think of July as the time of year when things slow down and everyone coasts hazily toward Labor Day. But it’s turning out to be one of 2017’s best months for music, with long-awaited returns from Broken Social Scene, Haim and Arcade Fire, plus diamonds in the rough like Sheer Mag, Dan Croll and This Is the Kit. Here are the 15 albums Paste is most excited to hear in July 2017. The Canadian supergroup reconvenes for their first album in seven years, once again pooling the talents of Kevin Drew, Feist, Metric and more. The grand and buzzing leadsingles promise an unfaltering return. A surprise announcement from the seminal rap group confirmed their first album in two years. Nothing Is Quick in the Desert marks the 30th anniversary of Public Enemy’s debut, Yo! Bum Rush the Show, so Chuck D and co. decided to give it away as a free download. After almost 10 years of consistently excellent releases, Kate Stables and her revolving company of players haven’t lost their zeal for creating folk that tugs smartly at the edges of the genre. On their first album for Rough Trade Records, This Is the Kit accent their off-kilter subtlety with the welcome addition of horns, as heard on the jaunty title track. Few albums this year have been as anticipated as the Haim triplets’ follow-up to their 2013 debut, Days Are Gone. If the recruitments of Rostam and producer Ariel Rechtshaid aren’t indications that Something To Tell You is going to be a well-groomed affair, then the hooky, teen pop pastiche of “”Want You Back should be. It’s impressive how seamlessly Public Service Broadcasting take their conception—using interviews, field recordings and newsreels in lieu of vocals—and transcend it beyond their electro-rock foundation. On their third record, the Brits take tackle a topic close to home: the slow collapse of Wales’s coal-mining industry and the tolls it took on the communities there. Cinematic and foreboding, Every Valley delivers the band’s heaviest impact to date. We fell hard for Japanese Breakfast’s breakthrough debut Psychopomp last year, as the Michelle Zauner-led project checked in at No. 3 on our list of 20 Best New Artists of 2016. Check out Japanese Breakfast’s latest single “Boyish” here. A new star on Philadelphia’s overflowing rock scene, Sheer Mag matches lick-laden ‘70s rock grooves with lead singer Tina Halladay’s spritey swagger. This is one of the best new rock bands around. Listen to first single “Lovestruck” here. Offa Rex is a collision of The Decemberists and British folk singer Olivia Chaney, a pairing that seemed destined to be. By and large a collection of contemporary arrangements of old folk songs, “The Queen of Hearts” takes all that is righteous in Colin Meloy’s music and weds it to Chaney’s fluttering voice. Shabazz Palaces soundtrack an afro-futurist with their spacey jazz experiments on Quazarz vs. the Jealous Machines. Bonus: The Seattle duo are also releasing an “extra-spatial twin” with the simultaneous release of Quazarz: Born on a Gangster Star. Double bonus: It’ll all be available as 32-page special-edition illustrated book. These guys are working hard. Mellow Waves is the first album from Japanese multi-instrumentalist/composer Keigo Oyamada in over 11 years. His classics Fantasma and Point established Cornelius as one of the foremost figures in the Shibuya-kei style of music, along with Cibo Matto, Towa Tei and others. Watch the cosmic video for “Sometime/Someplace” and get ready for another trip with Cornelius. All indications are that Lana Del Rey’s fifth album will serve another irresistible dose of what she does best: high-drama pop orchestrations grown from girl-group roots and her waifish voice. She’s already scored hits with her usual collective of collaborators (The Weeknd, A$AP Rocky), but appearances by Stevie Nicks and Sean Lennon may keep the rest of the record grounded. Although he’s received a national songwriting award and a huge following in his native England, pop craftsman Dan Croll has only recently started his hard-break into American circles. His second album, Emerging Adulthood, is built on slick, sticky electronics and big beats; lead single “Bad Boy” kindles your warmest Phoenix memories. Chaz Bundick has already enjoyed a solid 2017 with Star Stuff, his psychedelically smooth collaboration with the Mattson 2. Boo Boo’s introspective and hazy singles “You and I” and “”Girl Like You build momentum toward a chilly ‘80s throwback, which may be the last we hear from Toro y Moi for a while. For better or worse, Montreal’s finest have made a firm commitment to becoming a dance band, if a gloomy one. The woozy synths and ABBA feel of Everything Now’s title track are undeniably divisive, to the point where it has become required listening. The once-and-future chairman of the gore comes back with an album that boasts two songs with Cooper’s original lineup, their first recorded work since the 1970s. Paranormal’s personal wrecking crew also includes members of ZZ Top, U2 and Deep Purple.